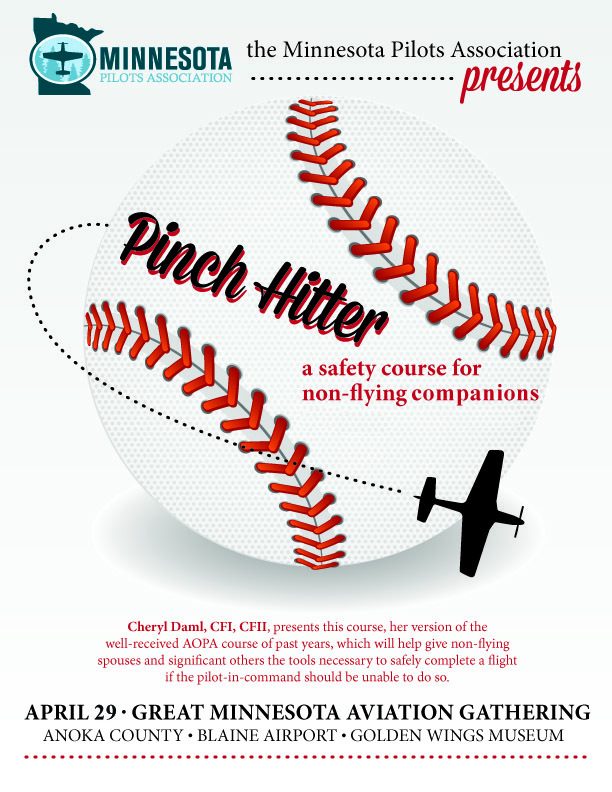 Her course will be from 9:00 to noon, and your non-flying companion can sign up for the course by going to the GMAG schedule page, clicking on her 9:00 a.m. session. This entry was posted in News on 04/08/2017 by Randy Corfman. Please make note that the Tree of Hope gift drive is soon to occur! 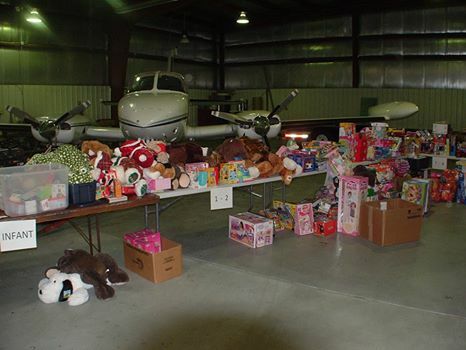 Collection date is Saturday December 3, 2015, 9AM – 1PM at the Maple Lake Airport (KMGG) FBO building. If you are new to the Tree of Hope, this wonderful organization helps to collect toys and distribute them to hospitals across Minnesota (since 1990). Tree of Hope is the only group that supplies toys to hospitals. In 2015, Tree of Hope delivered toys to 38 hospitals across the state of Minnesota for infants to 18 years of age. See the Tree of Hope website www.holidaytreeofhope.org for more information about of Tree of Hope. Like us on facebook https://www.facebook.com/TreeofHopeMn and see pictures from previous toy collections. You can also read about us in the Minnesota Flyer magazine – Oct and Nov Issues. If you can participate by organizing a collection in your local airport community, please do so and contact the Tree of Hope via links on their webpage or Facebook page. We hope this will be a state-wide effort, not limited to just the Twin Cities! Please note that www.holidaytreeofhope.org also offers you the option of making a monetary donation, in case you cannot make it out to the airport. Tis the Season for Giving…Let’s do our best to help bring some happiness to these children’s Christmas! This entry was posted in News on 11/20/2016 by Randy Corfman. We are delighted that three members of the Minnesota Pilots Association have stepped forward, expressing their interest in being board members for our organization. Mary Alverson is a native Minnesotan, born in Duluth Minnesota. She is truly an adventurer, travelling around the world both personally and professionally, serving as a flight attendant for North Central Airlines, Northwest Airlines and Delta Airlines for 38 years. Mary has gone on to distinguish herself flying professionally as a flight instructor and Captain for New Mexico Airlines. She has earned her CFI, CFII, MEI ratings along with a single and multi-engine sea class ratings. Mary is the owner/operator of Wings Over Water Seaplane Training. Mike Vivion soloed in 1969 and completed the requirements for his private pilot certificate in December of that year. After being released from the military, Mike returned to the University of Montana, completing a degree in Wildlife Biology He subsequently worked for the US Fish & Wildlife Service as a Wildlife Biologist and Wildlife Biologist/Airplane pilot for 31 years. Twenty nine of those years were spent in Alaska, where he worked airplanes on wheels, floats and skis in many regions of Alaska in support of wildlife research and law enforcement operations. In December of 2005, he retired from FWS and accepted a job at the University of Minnesota, Crookston, teaching in the Aviation programs there. In May of 2013, he retired (again) from the U of M system. Mike’s wife of 19 years is Gina Carolan and the couple now resides in Bozeman MT. Mike has recently become a board member of the Montana Antique Aircraft Association, the Sacajawea Audubon Society (the Audubon chapter in Bozeman, MT) and the Montana Audubon Society. Randy Schoephoerster is an established leader in aviation in Minnesota. He has over 10,000 hours flight time, with over 2000 hours in seaplane time. Randy holds ATP MEL, ATP SEL, ATP SES, CFI, CFII and MEI ratings. He serves as President of the Minnesota Seaplane Pilots Association and is an FAASTeam Lead Representative and Field Director of the National Seaplane Pilots Association. He is owner of Air Trek North Flight School and Maintenance with locations at KLVN, KFCM and KSGS. He has served as Marketing Director and Engineering Director for Emerson Electric and served as a City Commissioner. Randy has a BS degree in electrical engineering and an MBA in marketing. He feels his strengths lie in marketing, mentoring and organizational management. He also emphasizes that he is father of three great young adults. Ballots were emailed on November 9, 2016 to all active members. If your membership has lapsed and you wish to participate in choosing our board members, please renew your membership. Thanks! This entry was posted in News on 11/10/2016 by Randy Corfman. Planning Domestic Flights in MN? Must have a valid Passport beginning Jan 1! ATTENTION…PASSPORTS REQUIRED, STARTING JANUARY 1, FOR COMMERCIAL FLIGHTS IN MN. As unbelievable as that might sound, apparently Minnesota is one of four states which has failed to update our ID system by deadline, and you will need a Passport to fly domestically into and out of MN. Please check out http://money.cnn.com/2015/10/14/technology/passport-license-domestic-flights/ for details. MN PIlot Assn members…please pass this on to your family and friends so they can get their passports, if they do not already have one. This entry was posted in News on 12/05/2015 by Randy Corfman. The Executive hearing for Senate bill S.571 has been postponed to December 4, 2015. Please take this opportunity to contact Senators Klobuchar and Franken and seek their support! This entry was posted in News on 11/16/2015 by Randy Corfman. A recent announcement by Sen. James Inhofe (R-Okla.), the author of the Pilot’s Bill of Rights 2, about modifications to the bill’s language have raised plenty of questions among members of AOPA and the Experimental Aircraft Association. We’ll be up front with you: AOPA and EAA fully support the Pilot’s Bill of Rights 2, including these modifications. For more than 25 years, our two organizations have been pushing for aeromedical reform. Our most recent exemption request was made in 2012 and was much less expansive than the bill as it now stands, but it did not gain the traction needed for approval. We are farther along the road to substantive aeromedical reform than at any time in history. We’ve also been digging after answers on some of your most common questions. Why the changes in the bill’s language? Simply put, the original language of the Pilot’s Bill of Rights 2 did not have enough support in the Senate, despite your thousands of contacts with your senators. It was not going to pass or move forward in its original form. Inhofe knows the workings of the Senate extremely well, so he looked for a way to get support to move meaningful reform forward. They went directly after the objections voiced by fellow senators, and in doing so built bipartisan support from 67 senators across the entire political spectrum. What if I will only support the original language in the bill? Again, we’re going to be frank here. Accepting only the original Pilot’s Bill of Rights 2 language would mean failure of the entire bill. We would end up with nothing, the same way previous efforts for meaningful aeromedical reform have ended. No. This bill does not change any provision of the sport pilot rule. You may still fly light sport aircraft with at least a sport pilot certificate and a valid driver’s license in lieu of a third class medical certificate. Isn’t the requirement to have had a medical certificate within the past 10 years only a move to a 10-year renewal of a medical? No. 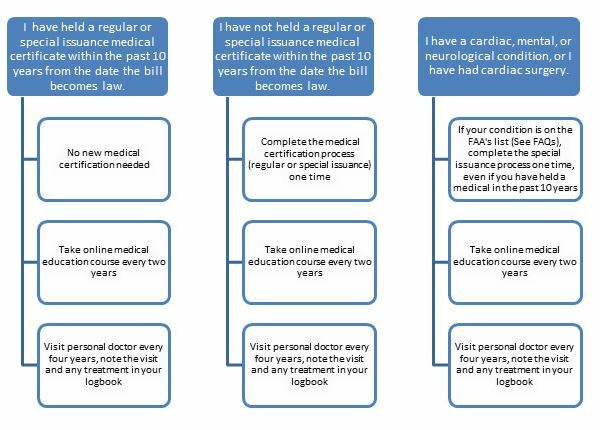 If you are a private pilot and have a valid medical certificate (regular or special issuance) within 10 years from the date when the bill is signed into law, you may never have to visit an AME again. You will simply have to take an online medical education course every two years, and visit your personal physician once every four years and note that visit in your logbook. No requirement will exist to report the outcome of the visit to the FAA. Even though I have held a special issuance within the past 10 years, I understand that I may have to get another if I have been diagnosed with certain conditions. What are those conditions? · Cardiovascular: myocardial infarction (heart attack); coronary heart disease that has been treated by open heart surgery, cardiac valve replacement; and heart replacement. · Neurological: epilepsy; a transient loss of control of the nervous system; and disturbances of consciousness without satisfactory medical explanation of the cause. · Psychological: personality disorder that is severe enough to have repeatedly manifested itself by overt acts; manifested or may reasonably expected to manifest delusions, hallucinations, grossly bizarre or disorganized behavior, or other commonly accepted symptoms of psychosis; severe bipolar disorder; and substance dependence within the previous two years as defined in FAR 67.307(4). What is this online aeromedical course and who will administer it? The online aeromedical course, taken once every two years, would be a requirement to keep your flying privileges. It would be free of charge to all pilots, whether or not they are AOPA or EAA members. We believe education is more effective than regulation, and this is the best way to get the important health information to everyone. It also would include information on how over-the-counter medications can affect our fitness for flying. The course will be run and maintained through the GA community’s communications channels, such as the AOPA Air Safety Institute. The FAA would only approve the content of the online course. If we as a flying community fail to show that we can be responsible for educating ourselves, more regulation will be put upon us. I feel fine. Why do I have to go to a doctor every four years to prove it? We’re pleased that you feel fine, but even if you weren’t a pilot, avoiding the doctor’s office isn’t the way to assure that you’re in good health. Most people see their personal physician for a physical every year or two regardless. This legislation eliminates the cost, paperwork, and extra hassle of regularly seeing a different doctor just to fly. It also eliminates many of the burdens placed on private pilots just because they’re pilots. Will this help me if I need a special issuance? Yes! One of the biggest problems with the current special issuance process is that it’s a continual renewal, with all the cost, paperwork, and hassle associated with it each time. 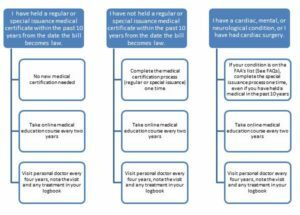 Under the bill’s language, you receive the third class medical special issuance once and you’re good to go, with only future visits to your personal physician at least every 48 months. In addition, the bill requires the FAA to streamline its special issuance process, so even that one time might not be as much of a burden in the future. I’ve heard that the FAA denies most special issuance medical requests, so I’m reluctant to even try. Whoever told you this is wrong. The FAA issues medical certificates to the vast majority—more than 98 percent, in fact—of people who complete the medical certification process. That includes those who are seeking a special issuance medical. And, under the Pilot’s Bill of Rights 2, you will only need to complete the special issuance process once. Doesn’t this just help old pilots? What about new private pilots who can’t get a third class medical? Inhofe heard clearly from fellow senators that in order to support the bill, they needed one initial medical approval by the FAA to ensure that a new pilot was in sufficiently good health to fly. That’s a one-time approval, compared to the biennial medical exam— sometimes more if certain conditions are involved—that is now required. That’s a pretty substantial step forward for everyone. Will I be able to get insurance if I fly under the rules set out in the Pilot’s Bill of Rights 2? Insurance companies have not yet addressed how they will handle medical reforms and are unlikely to do so until medical reform becomes law. Our 10 years of experience with the sport pilot regulations and other pilots flying sport pilot aircraft without a medical certificate showed little or no impact on insurance availability or rates. Since each company uses slightly different language regarding medical requirements, the best thing to do is to contact your insurance broker or company and ask how they will handle anticipated reforms. History indicates that compliance with the applicable regulations is typically all that is required by insurance companies, and the new regulations would not require an additional medical certificate for many pilots in the future. So, where do we go next? What’s the timeline? Even with all the progress, there’s still work to do. Few things move forward quickly in Congress. Inhofe would love to get more senators on board as co-sponsors—so, if your senator is on the list of those still not signed on, continue to contact them. Inhofe is also working to get the bill to the Senate floor. If approved there, it would move to the House, where nearly 150 representatives are co-signers of the original parallel Pilot’s Bill of Rights 2. We are seeking every potential avenue for progress in both houses of Congress. Predicting the pace of legislation is a fool’s game, but we’ll say it again: This needed reform is farther along now than ever before and we are working daily to get this done as soon as possible. It has support of GA groups, aeromedical groups, and several large airline pilot groups. Everybody would love it to move faster, but discouragement and doubt do not help. Let’s push this across the finish line! This entry was posted in News on 11/13/2015 by Randy Corfman. 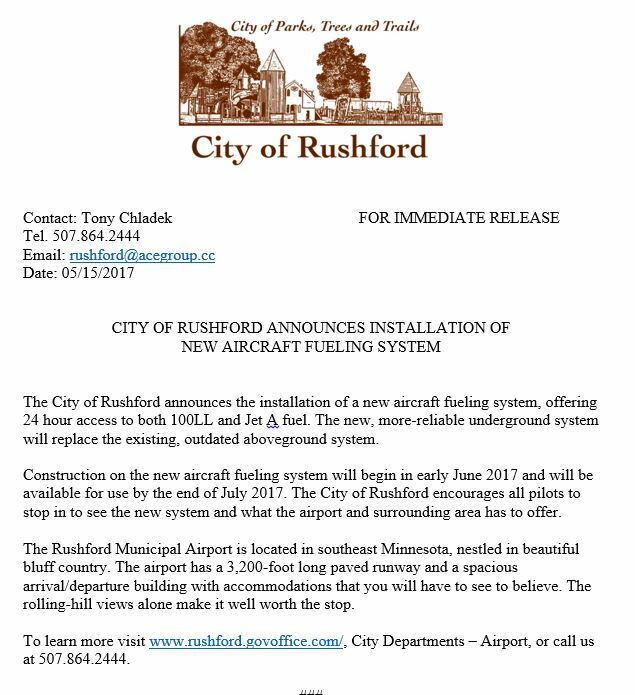 Attention Anoka County-Blaine Airport people! The annual Anoka County Airport Association (ACAA)/Metropolitan Airport Commission (MAC) bbq is tonight at the base of the tower from 5-7 pm. Please stop by and enjoy seeing your neighbors and enjoy good food and company! This entry was posted in News on 09/14/2015 by Randy Corfman. We are very pleased to have an invitation extended to MN Pilot Association members from EAA Chapter 25! On Sunday evening, October 4, 2015, EAA Chapter 25 will hold its annual banquet at the Eagan Community Center, 1501 Central Parkway in Eagan. The social hour starts at 5:30 p.m. with Dinner at 7:00 p.m. The presentation will begin at 8:00 p.m. The fees for the event are $22 per person for EAA Chapter 25 members and $25 for non-members. Contact Patrick Halligan at flyinghooligan@gmail.com, or phone him at 651-341-9264. This year’s speaker is none other than David Schall MD, our Regional Flight Surgeon, who will be speaking about the Doolittle Raiders. 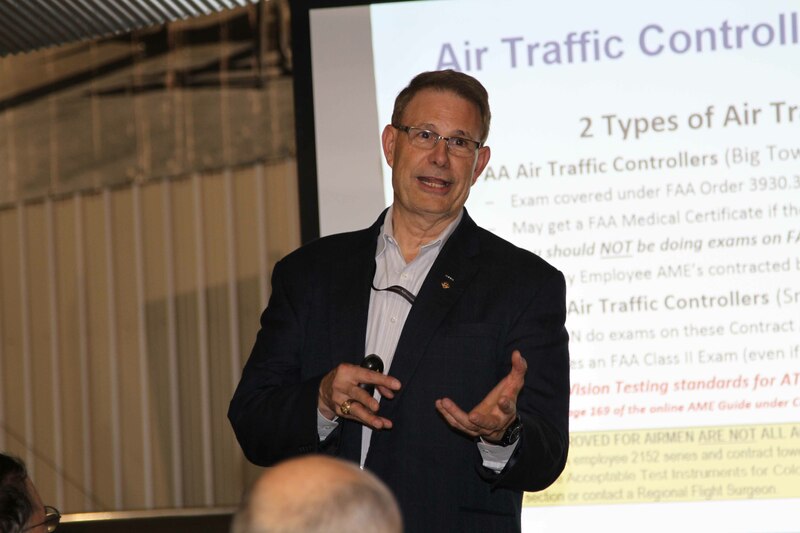 Some of you may have heard Dr. Schall, who is a wonderful historian and speaker in addition to being an excellent Flight Surgeon, give this presentation at our 2015 Great Minnesota Aviation Gathering. I was able to listen to a small part of that presentation and it was a terrific and well-researched event. Dr. Schall has interviewed many in preparing what is likely to become an excellent book, and his presentation shows a personal an in depth look at some very surprising and inspiring stories about one of the Raiders, who was a physician. This is one presentation that you will not want to miss. Really. History and Aviation and Patriotism all rolled up in one dynamic event. I hope to see you there! This entry was posted in News on 09/13/2015 by Randy Corfman.